Equally entrenched in the progressive rock of Radiohead as they are the folksy delivery of Wilco, The Snake the Cross the Crown's debut full-length release sounds like the perfect amalgamation of lonesome cowboy blues and elegant Brit rock. 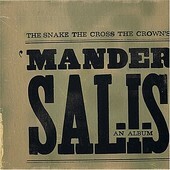 A shimmering 10-track endeavor, Mander Salis is a breathtaking display of master song craftsmanship, as an impenetrable wall of sound is created in the midst of melancholy acoustic melodies. The Snake the Cross the Crown's latest album is not only esoterically captivating, but it is a must have disc for those that crave lush, spacious rock.